A specialist team member in a police protective suit in Salisbury, England, last month. 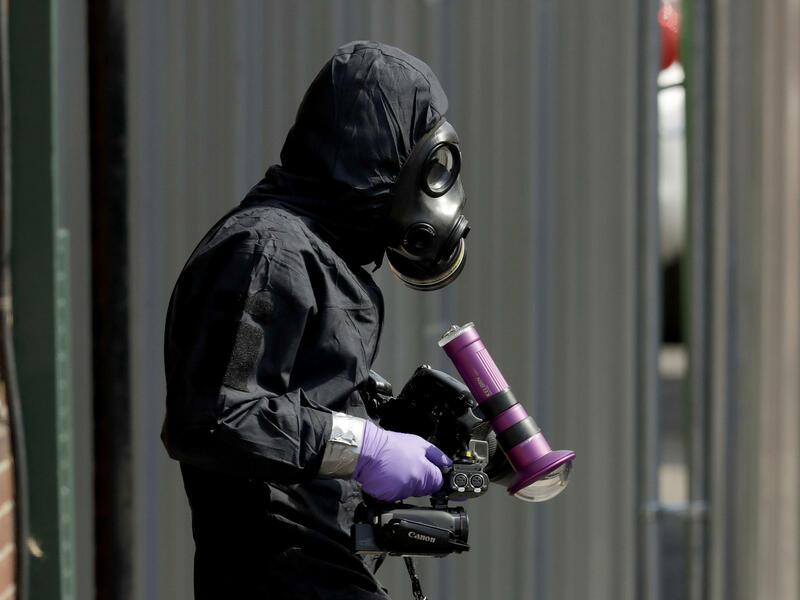 British police scoured sections of Salisbury and Amesbury in southwest England, searching for a container feared to be contaminated with traces of the deadly nerve agent Novichok. In a brief statement, State Department spokesperson Heather Nauert said the U.S. had determined this week that Russia used the nerve agent Novichok to poison Skripal and his daughter Yulia in March "in violation of international law" – a move that triggers sanctions under the Chemical and Biological Weapons Control and Warfare Elimination Act of 1991. The law requires the president to terminate arms sales, deny U.S. credit and prohibit the export of sensitive technology to any country using chemical or biological weapons. The Associated Press, citing an unnamed State Department official, says sanctions "include the presumed denial of export licenses for Russia to purchase many items with national security implications." However, the department says it will exempt aid to civil society and humanitarian groups and allow exports needed for continued U.S.-Russia cooperation in space. Nauert said the sanctions would begin on Aug. 22. They are expected to affect several hundred million dollars in bilateral trade. Russia, which has repeatedly denied being involved in the attacks, responded Thursday by calling the new U.S. sanctions "draconian" and rebuffed again the "far-fetched accusations" that it had used Novichok against the Skripals. Russian lawmaker Leonid Slutsky said that Moscow could retaliate by restricting exports of RD-180 rocket engines to the U.S. The super-efficient RD-180s, originally designed for the Soviet Energia heavy-lift launch vehicle, are currently used in the first stage of the U.S. Atlas V rocket, manufactured by United Launch Alliance, a consortium of Lockheed Martin and Boeing. Russia made a similar threat to cut off the rocket engines after the Obama administration imposed sanctions in the aftermath of Moscow's annexation of Crimea. Wednesday's announcement from Washington comes less than a month after a summit between Trump and Russian President Vladimir Putin in Helsinki that has sparked concern among both Democrats and Republicans over the president's reluctance to hold the Kremlin to account for interfering in U.S. elections. It also follows a letter addressed to the president late last month by the chairman of the House Foreign Affairs Committee, Rep. Ed Royce, R-Calif., insisting that Russia be punished under the act. Royce and other lawmakers have accused the administration of dragging its feet on making Wednesday's determination. Speaking after the State Department announcement, Royce said the administration was "rightly acting to uphold international bans on the use of chemical weapons." "The mandatory sanctions that follow this determination are key to increasing pressure on Russia," Royce said. "Vladimir Putin must know that we will not tolerate his deadly acts, or his ongoing attacks on our democratic process." Skripal was a double agent, working for years with Russian intelligence while secretly passing information to British authorities. He was convicted of espionage in Russia but released in a 2010 prisoner exchange and has lived in the U.K. since then. In early March, he and Yulia, who was visiting from Russia, were found comatose on a bench in Salisbury, Wiltshire, in southern England. British authorities later determined they had been poisoned with Novichok, a nerve agent developed in Russia during the Cold War. After extensive medical treatment, both have been released from the hospital. Last month, a British couple – Dawn Sturgess and Charlie Rowley – came in contact with Novichok in the same general area where the Skripals were poisoned. Sturgess later died. Authorities believe that the couple was exposed to Novichok that had been discarded following the March attack.